Did you miss “Countdown to UFC 171” on Fox Sports 1 yesterday? No worries, we’ve located the complete episode to help you get through the first workday after daylight savings. 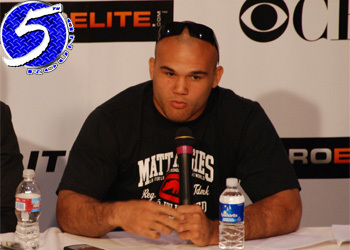 Robbie Lawler (pictured) and Johny Hendricks battle Saturday to become the UFC’s new welterweight champion. Former champ Georges St-Pierre voluntarily vacated the belt to take a break from MMA. Former interim champ Carlos Condit and Tyron Woodley meet in the co-main event. Condit earns next crack at the crown with a win. Diego Sanchez and Myles Jury get the card’s third-to-to spot.